The ones in red should be deep_water instead of shallow water. 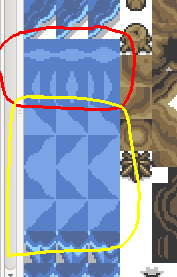 And the ones in yellow should be diagonal water/walls instead of shallow water. But I am a little confused. 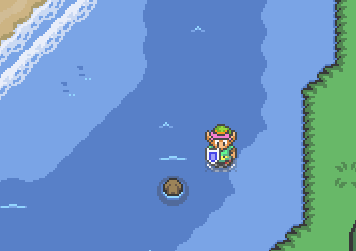 If the diagonal tiles that you highlighted should be wall/water ground type, then when the hero runs into them will he not be able to walk out of the water when colliding with those tiles? I meant diagonal water/shallow water obviously, sorry. my apologies....I have updated all the tiles you highlighted as well as all remaining water tiles within the tileset group to match the tiles found in your original outdoor tileset. They are all now deep_water ground type. ffomega, you don't need to apologies.. we love you, you and all the guys who make this dream come true.. we deeply appreciate all the work you have done. Thanks for all the joy you bring! In dungeon tilesets, hole.2 should not be repeatable in both directions but horizontally. Thank you very much for bringing that bug to my attentiopn all tilesets have been updated to reflect the error. So, reversed corners look not good. 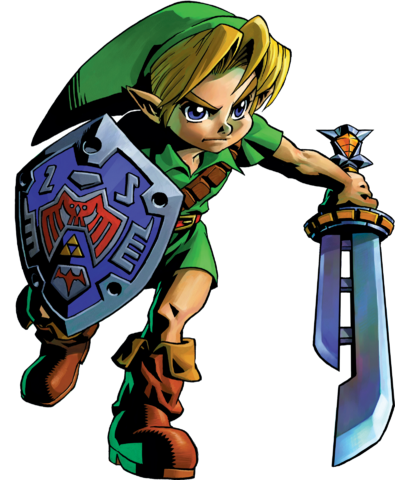 It is a slight inacurracy that also exists in A Link to the Past. ~Tile patterns "stage.6-1" through "stage.2-2" have been changed to "low wall" to allow projectiles to pass through them. ~Tilesets have the addition of "shadow" tiles to allow placing aesthetic darkened shadows on the floors below raised platforms. Basically to show depth between floors. ~Within the tileset images, the hole corners "hole.corner_reverse.1" through "hole.corner_reverse.4" have been visually improved and now look better. Thank you to those who noticed these bugs!! Please be sure to update your tilesets accordingly. These can be downloaded via the entire map pack, or individually from my site on the tilesets page. Attantion everyone! I left an update on the first page of this thread, stating that changes were made to the map pack. These changes should not alter your current maps, UNLESS you used Jabu-jabu for your maps. Re: [UDATE] Absolute Hyrule Map Package: WARNING: HUGE! Did anyone download the ALTTP outside sample maps that ffomega made? Because they were lost and it was a lot of work. I only have two of them (Kakariko Village and Hyrule Castle).